This is the best crumb cake recipe ever. 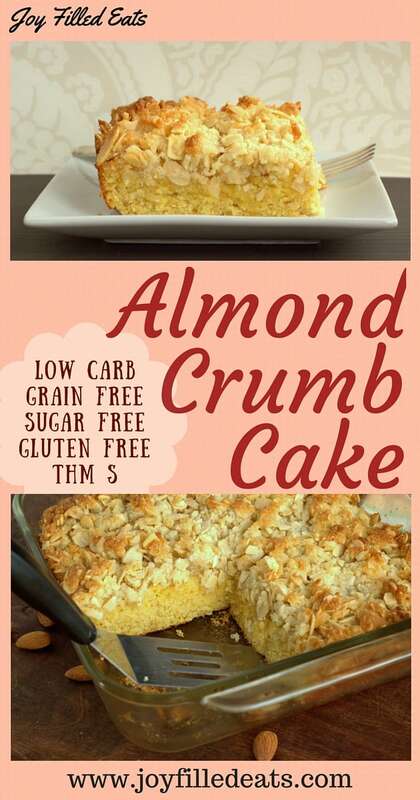 It has almond flavor throughout, the crunch of toasted sliced almonds, and the perfect ratio of crumb topping to cake, about 1:1. 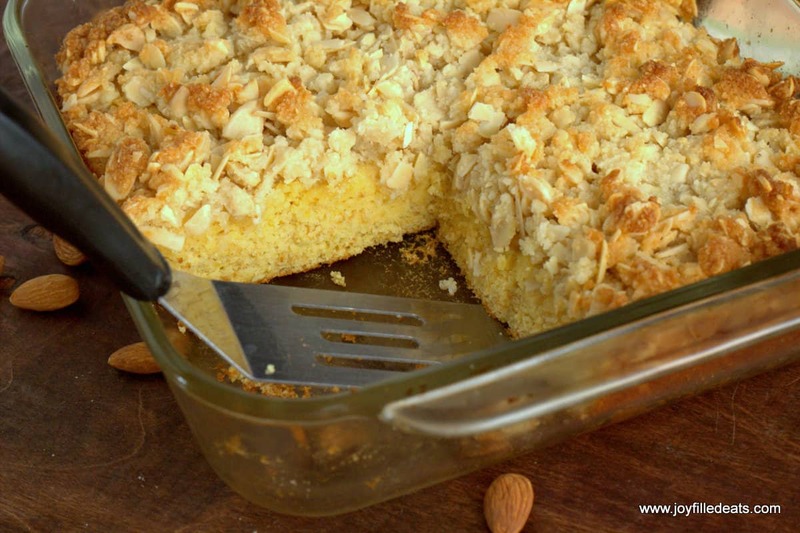 My Almond Crumb Cake Recipe is perfect for breakfast or dessert with a cup of coffee or tea. My husband is not a big dessert guy. He prefers desserts that are more subtle in their sweetness like cheesecake or lemon cookies versus a big hunk of chocolate cake with frosting. We spent his birthday in the car. Not the most fun way to celebrate. We had to drive ten hours to get home from visiting family for Easter. So he ended up having two birthday celebrations. The first was the day before at his sister’s house in Michigan with my Strawberry Shortcake Pound Cake. The second was the day after his birthday when we had a celebration at home with this Almond Crumb Cake. He’s a lucky man. 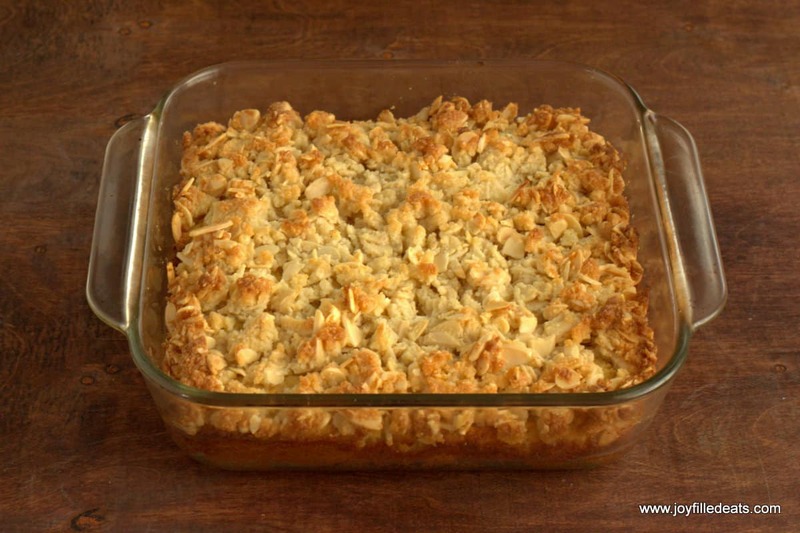 I must admit I’ve never been a real fan of crumb cake until I made this crumb cake recipe. There is just something about the traditional flour and sugar crumb cake recipe that is boring to me. It needed some pizazz. 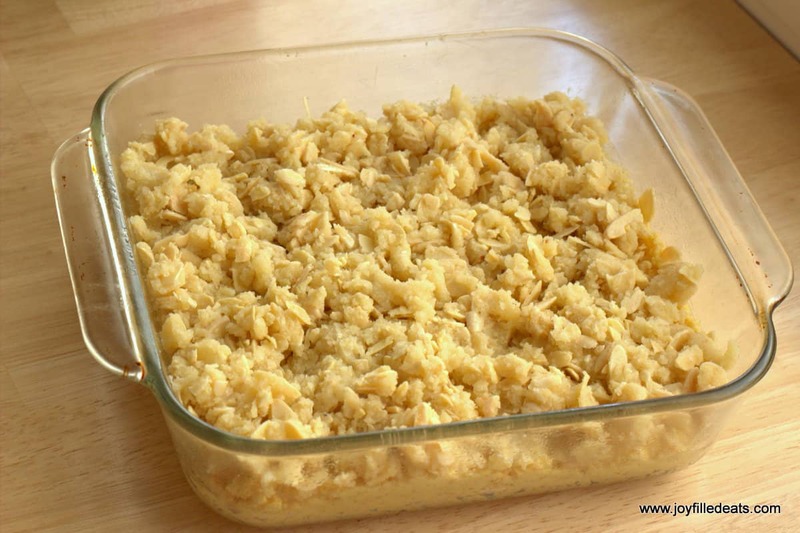 Adding almond extract and toasted almonds gave it that boost it needed. I have gone on to make a few other variations on this crumb cake recipe. They are all unique so I recommend trying them all! 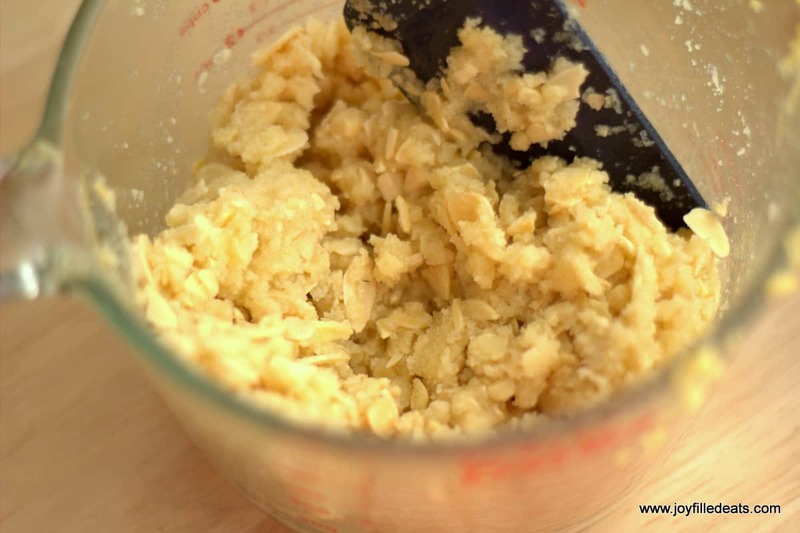 I hope you enjoy my crumb cake recipe! This is the best crumb cake ever. 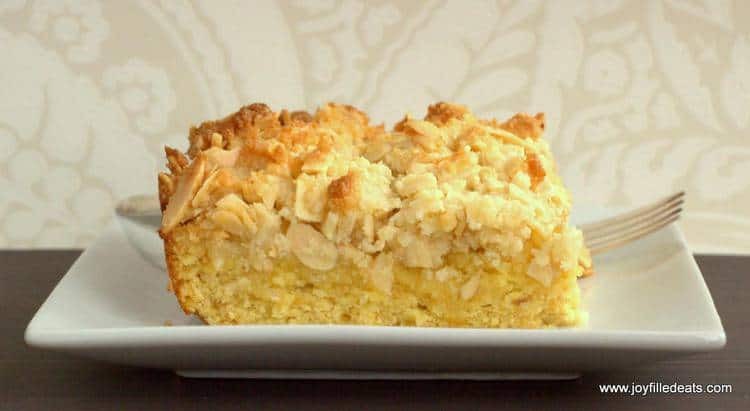 It has almond flavor throughout, the crunch of toasted sliced almonds, and the perfect ratio of crumb topping to cake, about 1:1. 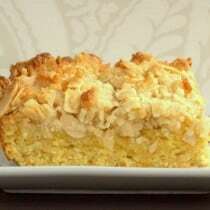 My Almond Crumb Cake Recipe is perfect for breakfast or dessert with a cup of coffee or tea. Preheat oven to 350. Grease a square 8x8 pyrex with butter or cooking spray. 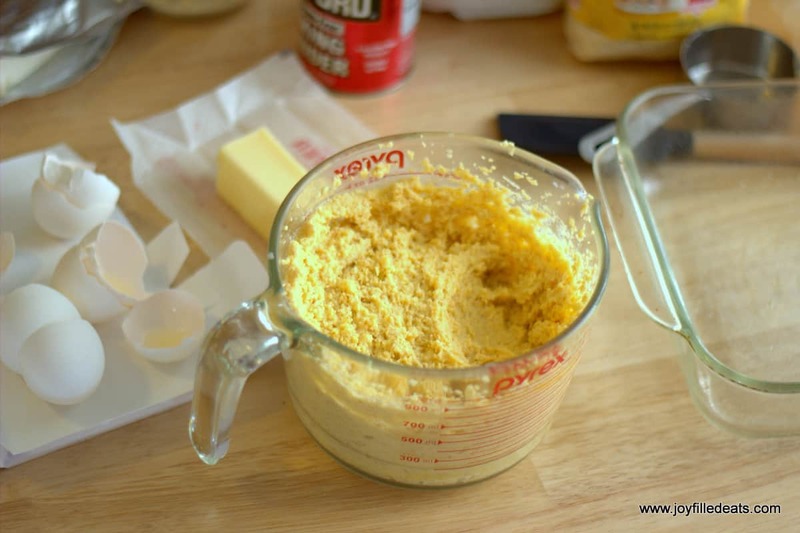 Combine topping ingredients and mix until crumbs form. Sprinkle on top of the batter. Bake at 350 for 40 min until golden. If the topping starts to get dark cover with foil for the last 10 minutes. Just tried the recipe tonight. Used 1/2 cup of Splenda in the batter and 1/3 cup Splenda in the topping. Turned out wonderful! Thank you so much!! I've made this twice so far. It's delicious. Once with the half and half and cream cheese and once with an equal amount of sour cream. There is not a big difference in texture but I prefer the sour cream texture, but it's not quite as sweet. I also have tried it with a layer of sugar free cranberry sauce between the cake and the topping, delicious! I don't get quite as much height in mine. Does yours actually rise? I can't tell if it's just the photo that makes it look taller. What’s half and half mean? It is half milk and half cream. It is common in the US. Hi Taryn! Have you doubled this recipe before? How would you adjust the cooking time? I have a big family and I believe this is going to be a favorite! THANKS SO MUCH for creating it!! I have not but I'm sure you can! I'd add 5 minutes on and then keep checking it. My guess is it'll take 15 minutes longer. Can this be made with THM baking blend instead of the other 3. If so, how much? Hi Callie, you can use baking blend in the cake, definitely. Use a little bit less. I do think the crumb topping will be better with the almond flour. I just made this today. It's very yummy and came out very moist. Taste like a bear claw donut to me. Lol. My only problem was you said in a comment your sweetness was 2 to 1 and all my sweetness were either different ratios or didn't say so I wasn't sure how much sweetness to use. I'm not good at figuring out what 2 to 1 is as I'm still learning. Without knowing how much your comparing your 2 to 1 ratio to on regular sugar. So I kept it within the range of 1/4 - 1/3 cup but tasted and dumped till I got it sweet enough. Thanks for this recipe. Hi Loretta, did you add more cream and coconut oil to the cake batter or topping? How much monk fruit did you use? Was it a blend like Lakanto? Monk fruit is 1:1 with sugar. The sweetener I use is 2:1. Do you know if honey can be used as a substitute for sweetener? And if so what the ratio would be? Thanks! Maybe honey granules. I think liquid honey would make this too wet. You would need 1.5 to 2 times as much. Hello, I was wondering if I could leave the cream cheese out? I can't have any dairy, but your cake looks delicious! I hope it won't mess it up if I dont use it? You can sub in coconut milk and coconut oil for the dairy. This is a dairy free crumb cake based off of this recipe: https://joyfilledeats.com/blackberry-coffee-cake/ If you leave out the berries it is very similar. Beautiful recipe. I would love to make this for a friend with an egg allergy. Has anyone tried it with flax eggs or another egg substitute? I made this for my extended family - none of whom are on plan - and everyone LOVED it. I used cream , not half & half. Served it with a dollop of whipped cream. Didn't have almond extract so I used vanilla. I will acquire almond extract before I make it again. But the vanilla was fine. Just not as "almondy"
Do I have to use a sweetener blend? Or could I just use eyrithritol? Just erythritol should work but you will need more. Up to twice as much. The sweetener blend I use is twice as sweet as sugar. Erythritol is 1:1. I just made this tonight. It was absolutely delicious! Thank you! For the half-and-half I used half cream and half vanilla cashew milk. — it’s what I had on hand. I will definitely be making this again. Yes, I think so. I'd use canned coconut milk. Half and half is half milk and half cream. It has a lower percentage of fat than regular cream. Half and half is common in the US. It is half milk and half cream. So wonderful to be able to have cake! Real coffee cake! I made mine with 1/2 cream and 1/2 almond milk, since I can't have milk anymore. It worked fine; absolutely delicious! Thanks so much, Taryn! hi! i want to use regular sugar and regular+almond flour is that ok? if so what amounts? and at what temp should i serve it? should it set first? thanks! I have not tried this with regular sugar or flour so I'm not sure it would work. You need twice as much sugar as my sweetener. The flour amounts should be similar. thanks! and should i let it set b4 serving? Your recipe calls for 4 oz. of half and half. That's a weight measurement? I'm confused because liquids are generally measured in cups. Is it 4oz by weight. Or 4 oz. liquid which is 1/2 cup? Yes, 4 oz is 1/2 a cup. My measuring cups show both measurements. Hi! This looks lovely, but could you please tell me what you mean by half and half? Where I live, it means half chips and half rice! Could I use just cream? Double or whipping cream? 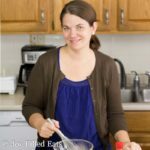 I can’t have milk on my keto diet so wondering if it will work? I've been trying to find a copycat low-carb recipe for almond Neiman Marcus bars. They are similar but have cream cheese on top. Thanks! Hi, Can you substitute brown sugar for gentle sweet? If so, what would the substitution be? Thanks! I think so but I haven't tried. You would use about twice as much. Gentle Sweet is twice as sweet as cane sugar. This looks so delicious! Any idea on the carb count per serving? I'm sorry but the substitution would vary according to the recipe. You can try just adding more almond flour. Thanks! Will give it a go ? What is THM gentle sweet? I wonder of those would be good with cinnamon and apples added?? Or would that be bad because of the apples? What about Apple extract? If I did use an extract...how much do you think would be used in this recipe? Thanks, I am new to Ketogenic diet and I'm never sure if it's okay to ever eat fruit besides berries occasionally. Hi Amber, I'm not sure apples would work in this recipe. I've never heard of Apple extract but any extract should be fine. Cinnamon would be yummy. You could add berries to this. I think a layer of raspberries under the crumbs would be delicious. Hi - love your recipes. Do you have the nutrition info about this? At least the carbs and fiber? Thanks! Thanks so much! New Type 2 in the house, so I'm learning a lot!